After many years of negotiations curling has finally become an Olympic sport. In the past it had been a demonstration sport at the Olympics three times. The last time was in 1994 in Lillehammer, Norway. In Nagano in Japan in 1998 it was finally included as a full sport. In the first Olympic tournament eight teams in each category (men, women) competed for medals. There was also a curling tournament at the Olympic Games in Salt Lake City in 2002 where it also received a lot of attention from the media. 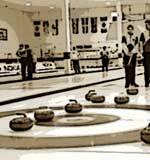 Curling has also been included on the programme of the Paralympic Games. Through its inclusion as an Olympic sport curling is attracting more and more fans not only in this country but also abroad.